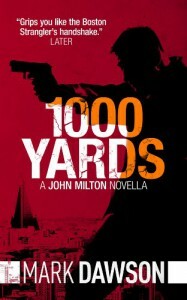 One Thousand Yards, A John Milton Novella by Mark Dawson is an intriguing story. He thought he had overcome the blackouts but had one on the flight to China. He is also plagued with memories of his nightmares. "He felt off-balance. The dream had passed, leaving tiny gossamer webs of memory that reminded him that he had had it. One thing was for sure: it was bad timing." I gave it four stars. John Milton is sent to North Korea. He has only a sniper rifle and a specific target. Will he be able to accomplish his goal? Or will he be killed as he attempts doing the job? I received a complimentary copy from the author. That did not change my opinion for this review.